We are open 24 x 7, call us now for free consultation! Damage to your automobile glass is not restricted to roadways and public places. Damage can happen at your home or place of business. There are many factors that can result in damage to your windshield, front, back and side glass. A plan of action is useful when this damage happens, but many people do not know what to do after damage is noticed. PG Agoura Hills auto glass repair provides mobile glass services and eliminates the stress involved when dealing with broken or damaged windows. A single crack may not appear to be harmful to your windshield and many people just decide to let it go. At some point in the future, that small crack will develop into a much larger crack causing more serious problems. Both large and small cracks should be treated with the same level of intensity. PG Agoura Hills auto glass repair technicians have the experience to restore any damage to your automobile glass and this maintenance will help prevent costly repairs in the future. Family vacations are not the preferred time for auto glass damage, but this damage is common for local families when traveling. Damage to windows or a windshield easily interrupts the travel schedule and lowers the morale and safety of all passengers. PG Agoura Hills auto glass replacement services help restore broken glass quickly. The mobile auto glass vans arrive to any location with trained technicians and the right parts to restore damage fast. Local families have a friendly and trusted partner for glass repair services. The size of the object that strikes your windows or windshield while driving does not matter. Any impact to your automobile glass will cause damage. Broken glass is a leading cause of auto accidents and collisions. When damage happens to your glass, you have the option of waiting for a tow truck or getting a fast replacement from PG Agoura Hills auto glass repair specialists. Knowing the right company to call eliminates the confusion and stress that is common when auto glass damage happens to you. By calling PG Auto Glass, you can have any damage to your auto glass repaired as soon as possible. Our technicians for auto glass repair in Agoura Hills are available at all times to meet you and repair, or if necessary, replace your auto glass. Our mobile vans for auto glass replacement in Agoura Hills carry all the necessities for repairing or replacing your auto glass, so that you are able to get back to your normal daily activities soon. Do you live or work in Agoura Hills, CA in zip codes 91301, 91376 or 91377? 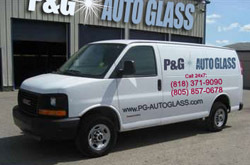 You can contact PG Auto Glass whenever you need auto glass repair or replacement services. Imagine my surprise and delight to come out and find a huge crack in the windshield of my car, which was parked on the street. It was beyond repair so I had to get it replaced quickly. It was very easy to make an appointment with P&G, and I was blown away by both the cost and efficiency of the repair, having compared prices with several other companies already. Orlando showed up to my workplace at the agreed time and got the job done quickly - I didn't even have to stick around while he worked, which was great. He was a nice guy and very professional as well. Hopefully I won't find any more surprise windshield damage, but if I do I would call these guys again. ©2016 PG Auto Glass. All rights reserved.